Bernie Tormé, former guitarist for Ozzy Osbourne and Gillan, has died at the age of 66. Tormé had been on life support for the past four weeks, according to his family. The guitarist's death was confirmed in a post on his Facebook page. Born in Dublin, Tormé first made his mark in London in the mid-Seventies with the Bernie Tormé Band. In 1979 however, he joined then-former Deep Purple frontman Ian Gillan's band, Gillan. His tenure with the group lasted two years. Following the death of Ozzy Osbourne guitarist Randy Rhoads in a plane crash in 1982, Tormé was recruited to take Rhoads' place in Osbourne's band. 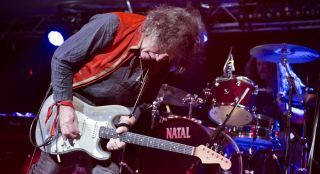 “Bernie Tormé passed away peacefully on the 17th March 2019, one day short of his 67th birthday, surrounded by his family," the guitarist's family said in a statement. "He had been on life support for the past four weeks at a London hospital following post-flu complications.